Bicycles in Edmonton have been in the news quite a bit recently, particularly given the success of new bicycle development in Calgary. Bicycle lanes in Edmonton have been proposed, installed, removed, illegally painted, removed again, and blocked in council quite a bit in the last few years. Frustrations between cyclists, city planners, and drivers have gotten to a boiling point recently, and I think it's safe to say that whichever side of the debate you're on you're likely sick of it all. But please keep reading! With all that said, things have recently gotten a bit more interesting from a data point of view. A month ago I was made aware of a data set of cycling injuries and incidents from 2009-2014 from the nice folks at Spacing Edmonton, which were analyzed by them as well as (more recently) the group over at Slow Streets. Specifically, the people at Slow Streets made the claim that injury hot spots indicate where more cyclists are travelling, showing cyclist 'desire lines' which would be prime targets for bicycle infrastructure. However, a quick look at the map suggests that the streets with supposedly lots of bicycle traffic are also the roads with lots of vehicle traffic. Hypothetically, even if all streets had the same bicycle traffic, we might expect a similar distribution since one might think that more cars might lead to more interactions with cars. Error bars represent the 95% confidence interval for injury rate. It looks as though there is a decisive link between vehicular traffic on a road and the number of cyclist injuries. As the city doesn't seem to have any specific information on bicycle ride distributions, it's hard to say with any certainty if the Slow Streets analysis is correct. Either way, it's clear that wherever cyclists mix with lots of cars, we get lots of injuries. This analysis ended up looking at 571 km of major roads with traffic data, which were responsible for 760 of the injuries recorded from 2009-2014. But hey, that's not all! 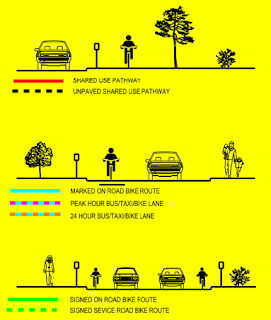 Edmonton also has a map of everyone's favorite (or least favorite) things - bike lanes! What are some takeaways from this? Well, first of all, major roads very infrequently have signed on-road bike lanes, so there's far too much variability for a proper analysis of them (green on the graph). Far more common are roads with separated shared bike paths (red), or no infrastructure at all (grey). From this, we get the firm (and hopefully not unreasonable at all) conclusion that biking on separated, wide, shared pathways for bikes is safer than biking on a normal road with traffic, by a factor of about 2. However, an interesting conclusion from this is that it's extremely hard to make the argument that painted bike lanes are safer than normal roads. In fact, in some cases, it looks quite a bit safer to bike on non-bike-laned roads. Weird. What might cause this? Well, first of all I'd say that this analysis is a few factors short of anything scientific. For instance, the bike lane map for Edmonton likely includes lanes and paths that haven't existed for the entirety of 2009-2014, or have since been removed, so some of the injuries from my analysis are likely classified inaccurately. As well, other researchers, when investigating bike lane safety, controlled for the presence of parked cars on the side of the road, which I did not. So while I wouldn't necessarily go so far as to say that my analysis shows Edmonton bike lanes are more dangerous than streets without bike lanes, I stand by the assertion that bike lanes aren't safer than streets without them. I embrace the subtlety of that distinction. 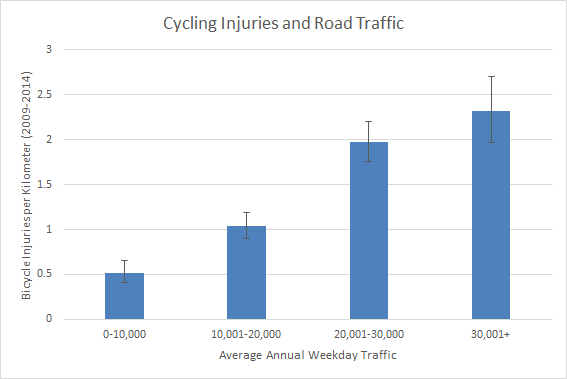 Regardless, the data is quite clear about the effects of vehicle traffic on bike incidents, and the effects of physically separating bike paths from roads. Namely, separating vehicle and bicycle traffic may reduce bicycle injuries by a factor of 2 on busy roads, and up to a factor of 6 on quieter roads. Again this is not surprising at all - I can't stress just how intuitive and likely boring the main finding here is. 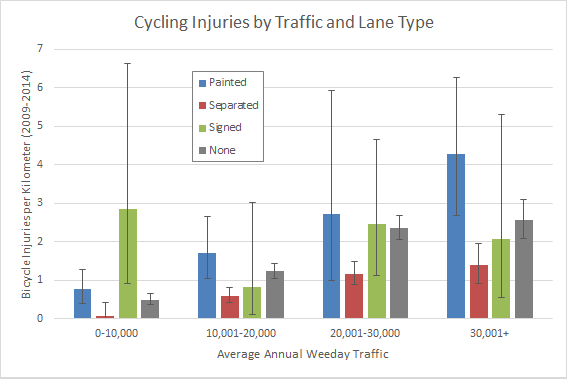 But this data set of cycling injuries from 2009-2014 does seem to show that painted bike lanes have not had the effect that was perhaps intended. In my opinion, having decent bicycle infrastructure is absolutely important to having a vibrant and healthy city. Hopefully future bike lane decisions are made keeping injury prevention and statistics in mind, in such a way that we can expand our biking infrastructure as effectively as possible. Interesting! 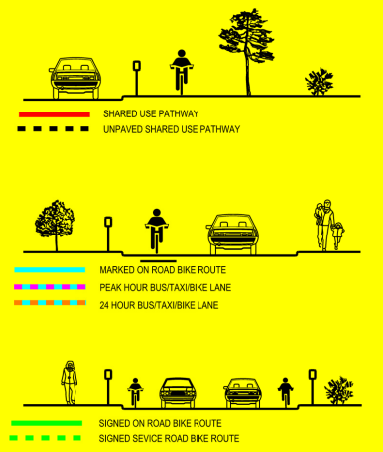 Out of curiosity, which category do the "sharrows" fall into? If you want to reach your goals successfully through term paper writing services, you have to fight Then you will be success in your life. What about the effect of the number of bicycles on accidents? There is an assumption here that more cars - more accidents. Aside fro being fairly obvious, is there more bicycle traffic? Maybe there is a correlation more between the number of bicycle riders than there is with cars.